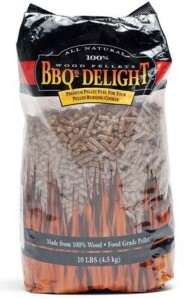 SmokingPit.com - BBQr's Dekight Hard Wood Food Grade Pellets review - Fuel for Traeger, Louisiana and LA pellet grills. Those who have used Traeger pellets know the pellets are pretty darn good. I have used them for a while now but one thing I have noticed is regardless of the flavor I use they all tend to smell the same and the flavor is close to the same. There is a difference in flavor but its very subtle. I have heard they used mainly alder and add flavored oil to their pellets. I'm going to do some research on this so I make sure I'm accurate. Regardless the fact remains the same. I can change from mesquite to hickory and near the same flavor. Igniting: The pellets ignited quickly no different then the Traeger brand. Immediately I could smell a difference. I have been cooking all week on Traeger Hickory pellets and I can tell you the BBQr's Delight pellets smelt like Hickory wood burning. This is what I would expect from "Hickory" pellets. 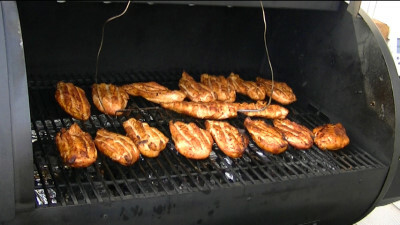 Once the smoker came up to temp I put the chicken onto the cooking grates and placed a temperature probe from my digital Maverick ET-73 thermometer near the center of the cooking grate. Over the next two hours I closely monitored the chamber temperature as well as the color and density of the smoke. The temperature stayed true as it should. The smoke was a nice thin blue smoke as it should be. Two hours into the smoke, I opened the hood and flipped the chicken. The smell was amazing. Again during the course of the smoke, the smell of the pellets was closer to wood then what I have experienced with other products. I kept monitoring things for approximately two more hours. I have to admit, I do not time my cooks. 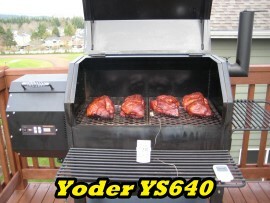 I pull my meats from the smoker based only on internal temperature and I always recommend others do the same. This way you will have perfection in your cooks on a regular basis. Upon taking the final temperatures of the chicken, I could not wait any longer as the aroma was way too good. I picked a chicken breast up of the grate and pulled it apart to sample it. I was amazed at the flavor. 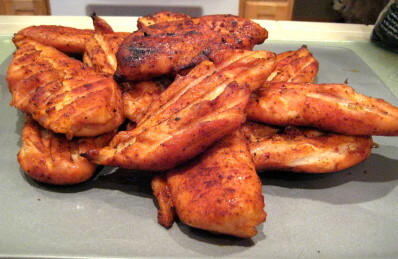 The chicken was moist with just the right mix of seasoning and marinade. The smoke flavor was without a doubt Hickory flavored and was just amazing. Feeding: The size of the pellets are what I consider a standard size. They seemed to feed through my auger without issue. Now the Louisiana pellet grills have a short throw auger design. They are less apt to have feed issues. That said, I fired up my Traeger Texas and ran it for a couple hours just to make sure they fed the Traeger without issue. This test was a success as I figured it would be. Burn: As I mentioned above the pellets seemed to burn flawlessly providing a nice thin blue smoke. How efficiently the burn will be apparent in the inspection of the fire pot. Upon inspecting the fire pot and lower chamber of the smoker the pellets appeared to burn down completely leaving a fine ash behind. All in all I am very impressed with this product. BBQr's Delight pellets can be purchased in 1 lbs. and 10 lbs. 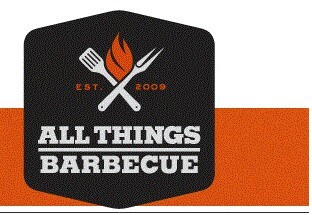 bags online from All Things BBQ. Order online and they will have your pellets to you quickly. Don't want to order online, just call (316) 440-3950. I have spoke with their folks on several occasions and they are great to work with. They are among the few these days that truly believe customer satisfaction comes first. 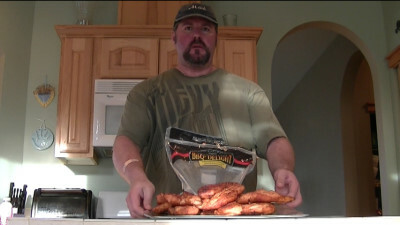 Also see my product review on Bear Mountain Forest Products BBQ Pellets.